Discover a world of first class apartments with historic appeal and a premier location in Old Town! Old Town's newest apartments are located in the heart of the square! Urban warehouse living in historic Old Town Wichita! 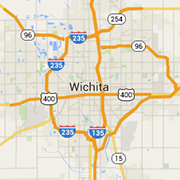 Luxury apartments, centrally located in downtown Wichita, Kansas. Wonderful apartments in the heart of the city. The Perfect Location! Unique one and two bedroom lofts in historic Old Town.